Follow Us On Twitter for Contests and UpdatesDon’t forget to follow us on Twitter for updates, news and contests announcements for when we give stuff away! If you aren’t following ... Read more.. If you would like to double confirm the order with us or has any questions, pls. 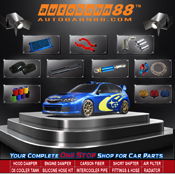 email us the transaction ID at cs@autobahn88-au.com Emotion silicone hose are constructed by the toughest polymers ... Read more.. If you would like to double confirm the order with us or has any questions, pls. 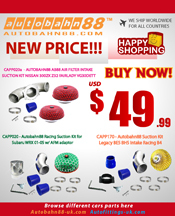 email us the transaction ID at cs@autobahn88-au.com Instruction:Simply remove the existing plug replace ... Read more.. If you would like to double confirm the order with us or has any questions, pls. email us the transaction ID at cs@autobahn88-au.com Type : Bonnet Damper / Hood Damper Application : Nissan Fairlady 350Z ... Read more..
Good News !!!! Audi S4 A6 Bi-Turbo Hose Kit back in stock today!!!! :twisted: More detail about the products, pls. visit autobahn88-au.com Read more.. Type Top Mount Intercooler (Tube and Fin , by vacuum braze) Material 100% Aluminum , Vacuum Brased Application Subaru GC8 Type D-G EJ20 1996-2000 Core Size 380x160x100mm (15″x3.25″x4″) Overall size 470x300x120mm (18.5″x12″x4.75″), Outlet 70mm Weight Only 4.8kg Description 100% Direct Bolt-on No Modification need Intercooler ... Read more.. Type Universal Muffler Hangers Size (Hole ID) 12mm / 0.47inch Hole Distance 42mm / 1.65inch Material Poly-Urethane Colour Blue Application Universal, for all car Read more..
Why not join and follow Gex Peformance on your favorite Social Media sites like Facebook, Twitter, Google Plus, Blogger, YouTube? Show the world you are a fan of Gex Performance ... Read more..